Knitting Relaxes Me: FO: Honeybee! Finished at 11:45 Wednesday night, but not yet blocked -- all 8 feet of her. Harley likes her, too. When I block (probably Sunday, during the next predicted snowstorm), I'll try to pull the sides out, to make her a bit wider. See the few inches that need to be woven in in the picture below? That's ALL the yarn I had left! I'll post specs with the blocking pictures in a few days. So last night, I cast on Wisp with some beautiful tea rose Kidsilk Spray. I knit a few rows, decided it needed to be wider, and frogged. Except, of course, Kidsilk Spray doesn't frog so well, so i just cut it off. Luckily, I have 4 skeins of yarn for a pattern that calls for 1! Tonight, because I'm no longer in a Wisp-y mood, I think I'll cast on for my Bird in Hand mittens. Of course, I could work on my hat... But I think my hands are colder than my head! Wow! That's long enough for your very tall sister! Honeybee is GORGEOUS! You're a lean mean lace knitting machine! And you had enough yarn! Can't wait to see it blocked. It sure SOUNDS long enough - I can hardly wait to see it blocked! 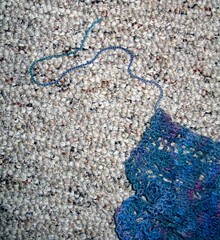 Yikes, that's WAY too little left over yarn.